The Mia SP Pendant Light by Vistosi has been designed by Vetreria Vistosi's Studio Tecnico. The Pendant offers a soft shape gently rounded at the top, while the ceiling lamp ensures an excellent adhesion to the surface thanks to the metal body that reduces the distance to the ceiling. 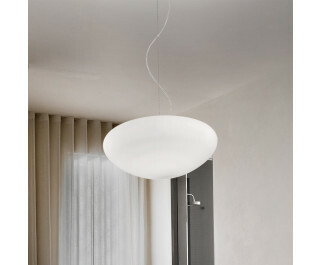 This contemporary suspension lamp from Italy is made of a murano glass.